The halls are decked, the carolers are about, and Christmas is only three days away! As a Jane Austen fan, this time of year always has me thinking about Emma and the Westons’ Christmas Eve dinner. It especially has me thinking about that dashing Mr. Knightley and how, the moment it starts to snow, he takes charge and makes sure that everyone—Emma’s father, Mr. Woodhouse, in particular—gets home safely. That gesture is just one of the many reasons why I love Mr. Knightley so much, and why he’s our Literary Hunk of December. I truly love every little thing about George Knightley. He’s humble, he’s his own man, and even though he’s rolling in money, he doesn’t ever flaunt it. Instead of taking a carriage, he walks everywhere he goes, and he doesn’t limit his friendships to upper-crust society. In fact, he far prefers the company of the Robert Martins of the world over, say, the Mr.Eltons (who wouldn’t?) and he is so kind to the poor, overly talkative Miss Bates. He’s considerate of the fact that her station in life has fallen, and when Emma jokes at her expense, he reprimands our title heroine on her “badly done” behavior. Mr. Knightley never ceases to call Emma out on her crap, and it’s entirely because he has her best interests at heart. Here’s the thing about our dear Emma Woodhouse: She’s spoiled, she’s vain, and she thinks she knows better than everyone. Like a true bestie, Mr. Knightley sees beyond all of that and loves her for exactly who she is. Sure, they get in major fights—about her ill-fated matchmaking, about Frank Churchill, about Miss Bates, about Emma convincing Harriet to turn down Robert Martin—but that’s only because he wants to bring out the best in her. Besides, any two people who can fight that passionately are bound to love that passionately, too. There are no minced words between Emma and Mr. Knightley. They’ve known each other for 21 years—Emma’s entire life—and have that type of comfortable friendship where they can fight and make up the next day. They know each other’s flaws and best qualities and love them all. Best of all, there are no flowery overtures needed to show just how much these two mean to each other. 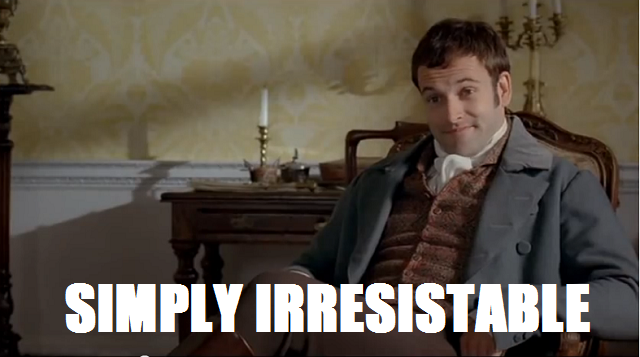 Mr. Knightley’s proposal says it all when he states, “I cannot make speeches, Emma. If I loved you less, I might be able to talk about it more.” That’s a real man right there. His actions speak for themselves. His forthrightness speaks for itself. Leaving his estate to move into Hartfield because Emma can’t leave her father speaks for itself. If I loved Mr. Knightley less, I might be able to gush about him more, but for now I’ll just say how grateful I am that Jane Austen created him over 200 years ago. He’s honest, he’s level-headed, and he’s compassionate, and those qualities can never be badly done.